Posted June 7, 2011 by finnfemme & filed under Fashion, Vintage. 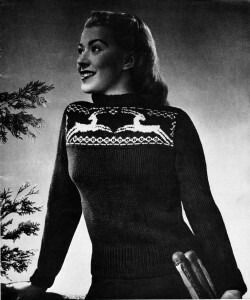 This sweet 1940s knitting pattern is for a sweater with, for all things, antelopes! I think it is completely fresh, original and oh-so charming. It is just so darn jaunty. I’ve been thinking how really cool it is to knit sweaters using vintage patterns. You get the double advantage of new materials with an old design. Plus, you’ll most likely have a one-of-a-kind garment, which is cool these days when most people wear the cookie-cutter mall look. That’s what is great about vintage clothing, and vintage sewing and knitting patterns. You get to develop your own style completely. You won’t have to worry about someone else wearing your same look on the red carpet (for the celebrities among us, that is). You’ll stand out in your own unique way, which believe me, is wonderful. I get weary of looking at a sea of jeans and sweats, all in drab colors of blues and grays!